EcoNow Solutions uses cutting edge technology to find solutions for ecological issues that affect the environment and people who live in it. For many years, our focus has been on industrial applications but we have now taken our groundbreaking technology and applied it to homeowner applications including septic system maintenance and drain care. By using EcoNow Products the homeowner can easily and cost efficiently maintain their septic system so as to avoid messy, smelly and costly back-ups; and treat their drains, pipes and garbage disposals to remove years of build-up and prevent clogs before they occur. It didn’t take long for EcoNow to be recognized for our superior products and innovative technology. EcoNow’s products were recently selected as the product of choice to appear on a segment of the long standing home improvement show Designing Spaces Airing on Lifetime Television. Designing Spaces™ is a signature home improvement show celebrating its 12th season on air. In their feature entitled “Green Spaces – How to Maintain Your Septic Tank Safely”, EcoNow’s “Septic Oxy-Tabs” was the product selected for its superior performance and innovative technology. 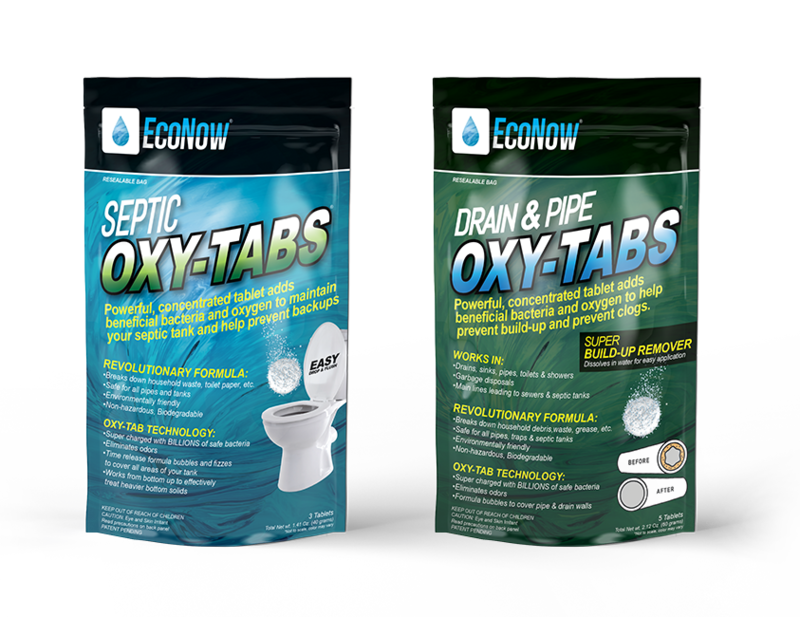 EcoNow Oxy-Tabs utilize OXY-TAB technology to provide oxygen, buffers and billions of beneficial bacteria and enzymes that encourage the breakdown of household waste, solids, grease, and toilet paper to properly maintain your septic tank or remove build-up in your pipes and drains.